MEA Polyurethane Market size for automotive industry is set to surpass USD 385 million by 2024; according to a new research report by Global Market Insights, Inc. Rising passenger car vehicle production owing to high spurge in middle-class and youth population along with demand for luxury vehicles will stimulate the need of these products in the MEA region. 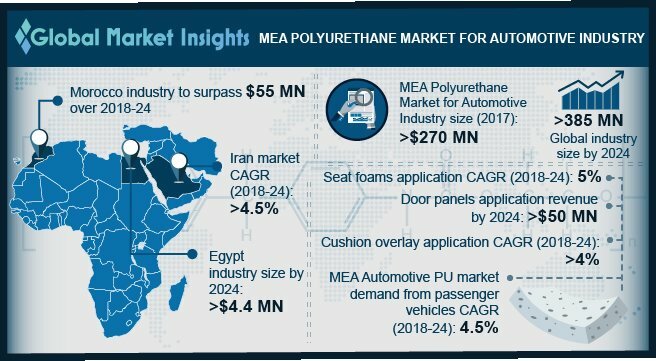 The middle-class population in Africa is approximately 35% of the continent’s total population and is expected to grow at a faster pace which will further foster MEA polyurethane market for automotive industry. Polyurethane products are lightweight, durable and provides excellent corrosion resistance, sound absorption and insulation properties. These materials offer automobile manufacturers to produce seating’s which are easily recycled, assembled and disassembled. Additionally, coatings from these materials provides protection from oxidation and humidity along with providing glossy shine to vehicles. Growing consumer preferences towards high performance plastics as a substitute for conventional metals will stimulate the MEA PU market for automotive industry demand. Good economic conditions along with higher disposable income of consumers and abundant availability of raw materials including crude oil, used in manufacturing of PU products will stimulate MEA polyurethane market for automotive industry growth. Middle East crude oil natural reserves accounted for over 8,02,846 million barrels in 2016 which propagates transport sector growth in the region. Government initiatives along with rising investments of international players in Iran crude oil production are likely to boost crude oil production, promoting MEA polyurethane market for automotive industry growth. Morocco polyurethane market for automotive industry is expected to surpass USD 55 million in the projected timeframe. The country is considered an automotive hub in North Africa owing to availability of labor at cheaper costs along with rising government initiatives and constitutions making it attractive for foreign investors. Plastic materials incorporated into automotive interiors helps in reducing the overall vehicle’s weight to a large extent which further minimizes the CO2 emission and provides cost savings. MEA PU market for automotive industry demand from cushion overlay application may witness growth at over 4% over the forecast period. Cushions used in automotive car seats provides pleasurable driving experience along with maximizing ease and flexibility for passengers. Rising consumer demand for maximum safety and comfort along with enhanced aesthetics will majorly influence the PU market size. Modern vehicles consist of high amount of plastics which accounts for approximately 50 percent of the overall volume and 10 percent of the overall weight of the vehicle. The production of light weight vehicles, increasing sustainability and reduced fuel consumption highly provides valuable aesthetics. Rising passenger vehicle production along with increasing consumer demand for vehicle aesthetics is expected to foster market demand. MEA polyurethane market for automotive industry in UAE is likely to register gains close to 2% over the forecast period. Rising infrastructure spending, low interest rates and divergence of demographics & affluence levels will drive the demand for light vehicle in the region. Growing demand for premium and luxury cars owing to strong GDP and high investments in automobile infrastructural programs will propel country industrial growth, thereby enhancing product demand. TDI and MDI are widely used in the manufacturing of PU for the automobile sector. PU foams are gaining popularity and increasing usage in car seat padding owing to the freedom of geometric design along with material’s flexibility as they can be adjusted while manufacturing to achieve the level of comfort targeted for the car seat, resulting into growth of MEA polyurethane market for automotive industry. BASF, Bayer, Johnson Controls, Huntsman, Dupont, Dow chemical, Raha, Poly products and Deltachem are the prominent industry participants in the polyurethane market for the automotive industry. OEM manufacturers are strong engaged in R&D activities in order to comply with government fuel emission standards along enhancing their product offerings and global reach by forming joint ventures and partnerships.